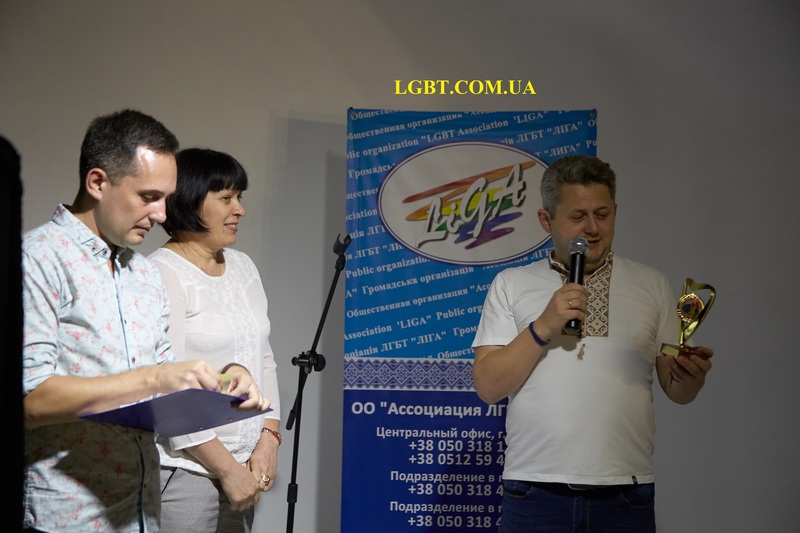 On September 6, 2017, within the framework of the Equality and Pride Days in Kherson and Odesa, the doctors consulting the LGBT families were awarded with the Professional Heart awards. A mini-training session for health services providers working in the city, including LGBT families, was held in Kherson. At the training, doctors, nurses and psychologists talked about the specificity of the group, the specifics of work with LGBT, the risks assessment of community representatives and possibilities for their reduction to prevent transmission of HIV / AIDS and other sexually transmitted infections. During the event, Kherson doctors were awarded; Maxim Ponedilko received one of them. He also works in the Professional Heart: Equality, Health, Safety project funded by ILGA-Europe and COC Netherlands as part of the Allies in Action program. «I want to thank the doctors for their cooperation and active assistance to the LGBT community, but I want to express my special gratitude to Maxim Anatoliiovych for his cooperation, his professionalism, responsiveness, activity, as well as his interest and involvement in the process. He is the most active consultant,» said Svitlana Serednia, head of the LGBT Association ‘LIGA’ in Kherson. At the opening of the Equality and Pride Days in Odessa, the award was given to Chubach Mariia Ivanivna: a senior infectious disease doctor, an assistant of the Department of Infectious Diseases of the Odessa National Medical University. «I am very happy to present this award to Chubach Mariia Ivanivna, who does a lot to keep people healthy for longer periods of time, because it is our value: if you are healthy, then you are successful. We want to thank you for what you did and continue doing for us,» said Oleg Alyokhin, chairperson of the LGBT Association ‘LIGA’. The Professional Heart award was launched by LIGA in 2017 within the framework of the Allies in Action program. Since 2014, the organization has been awarding allies of the LGBT community with the Rainbow Ribbon Award for promoting tolerance. LIGA has been working in Ukraine since 1993 as an informal creative association. Since December 1996, the organization has received legal status and has continued carrying out advocacy, human rights, social projects for LGBT people in Kyiv, Mykolaiv, Odesa and Kherson, as well as supporting work of other LGBT organizations and groups through the Resource Center.